These dads are sick and tired of relying on other folks to do their daughters hair. 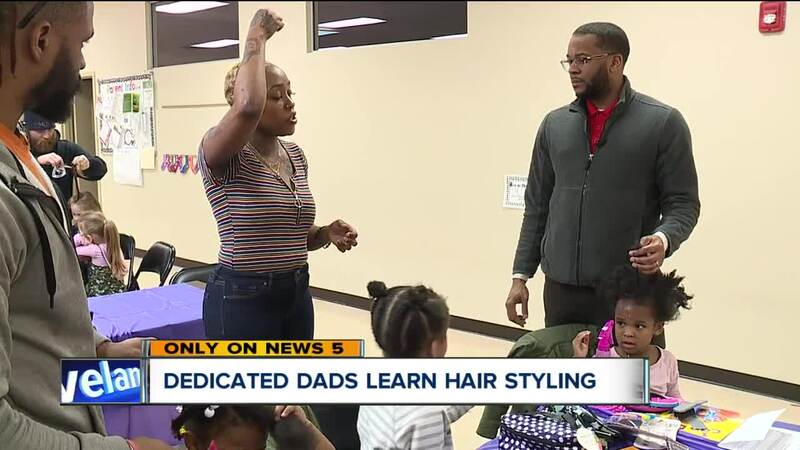 ELYRIA, Ohio — These dads are sick and tired of relying on other folks to do their daughters hair. "Were always taking pictures and my wife later on looks and she's like, 'What were you doing? What did you do? Why didn't you call someone to help,'" said Frank Whitfield. Whitfield and a handful of other dads learned to braid, ponytail and even add some cute bows all by themselves. "These are our princesses, they are a reflection of us," said Whitfield. "I love my girls and so many of these men in here, you can see how much they love their girls it brings out another part of us as well." The event happened on Tuesday night at the Lorain County Community Action Agency Head Start in Elyria. The stylists who put on the event couldn't stop singing these dads praises. "It actually gives me more energy, because I'm like what's the next thing-who can I teach next," said Tieya Riggins of the 'Natruelly Me' salon. "They really were engaged and really wants to learn so that kind of puts a smile on my face," said 'Regis Salon' stylist Tia Werts. The pair not only showed these dads best practice but they were also dishing out confidence. "You won't get it on your first try, you may not even get it on the fifth try, but if you keep at it you will eventually get it," said Riggins.